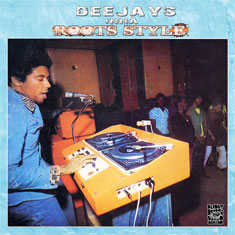 First came DEADLY DRAGON INNA ROOTS STYLE and now we are coming with the big Part Two -- DEEJAYS INNA ROOTS STYLE. This CD is a celebration of the often overlooked power of seventies Roots DJs. In our opinion certain DJs in the 70s could take hold of a serious underground roots riddim and ride it to a place of pure consciousness just as well as any singer. So, we have put together a mix of 38 tracks by DJs like Bongo Gene, Jah Stitt, Big Joe, Prince Far I and more that had that perfect combination of driving riddim and ferocious vocals. From one track to the next, the power of the DJ grows and grows so we hope you enjoy this ya one! As always, our CDs are mixed live with 2 turntables, mixer and sound effects...absolutely no computer overdubs or edits.